Rule the road and give police the slip with our newest guide. Electronic Arts and Firemonkeys' latest arcade racer, Need For Speed: Most Wanted, has no shortage of thrills, as you steer more than 35 muscle machines through the fictional city of Fairhaven while avoiding the law. The game accelerates automatically, giving you the chance to worry about other things. 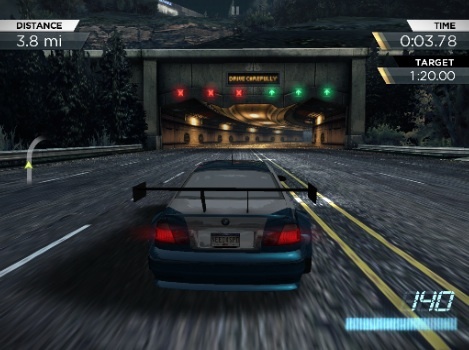 That said, our Need For Speed: Most Wanted cheats and tips guide will help you finish first in no time. By all accounts, the police in this game are a nuisance, eager to steer your vehicle into guardrails and further impede your progress with spike strips and roadblocks. With this in mind, do your best to get bothersome cops off your tail. You'll do this by performing takedowns, like ramming police into oncoming trucks or cars, and slamming into their cruisers at high speeds. The best part? You'll receive nitrous for your efforts, which leads to our next tip. Every car in every race has access to Nitrous. Your opponents will use it whenever necessary, and you should do the same. To activate it, swipe the screen. Just brace yourself for the speed boost, and try to use it while traveling through straightaways, and not careening around turns. Reinflating Tires ($1,000): Protects against police spike strips. Impact Protection ($1,000): Body hardened to protect against impacts. Nitrous Refuel ($2,500): Refuels nitrous more efficiently. Power Pack ($3,000): Engine tweaks increase top speed. While racing, be on the lookout for branching paths. Although you won't receive bonuses for taking shortcuts, flying off a ramp may move your car one or more positions ahead of the competition. Although it's small and doesn't showcase the entire track, the mini-map on the left side of the screen is a great way to keep an eye on other vehicles (including cops). No need for an unwelcome surprise. To afford the most expensive rides as quickly as possible, consider making an in-app purchase. -Change controls (tilt or touch and swipe) from the Options menu. -Switch to MPH and KPH from Options. -Complete objectives to earn Speed Points. Check your progress from the Driver Details screen. Speed Points transfer from console to mobile.